Tru-Clean Carpet & Tile Care has an A+ Rating by the Better Business Bureau, and we are a five-year-in-a-row-winner of the coveted Angie’s List Super Service Award. Our thoroughly exhaustive approach to dryer vent cleaning is relied upon by realtors, apartment complexes, condominium associations and homeowners who don’t want to worry about a fire starting in their dryer vent ducting. We take our job or dryer vent cleaning seriously. We have to, as families depend on our cleaning services for a good night’s sleep. Our services begin with the testing of the air flow of your dryer vent before and after cleaning. This measurement allows us to determine the airflow efficiency before and after the cleaning. The next step is to disconnect the dryer vent and use a video scope to inspect the inside of the dryer ducting, from the wall to where the venting exits the home or structure. This scoping allows us to check the health of your ducting and note any obstructions such as lint build up, potential bird or insect nests, twigs and other impediments. The technician will then insert a rotating brush and safely snake it through the entire duct system while a powerful vacuum or truck mount unit is used to evacuate the dislodged contaminants as a result of the rotary cleaning. We will then reinspect the ducting with a video scope, and upon exceptional results, we fog the ducting with an antibacterial, clean under and around the dryer, vacuum the dryer vent screen and reapply the vent duct. Dryer duct cleaning prevents dangerous levels of a buildup of lint, potential nests, and other obstructions while significantly reducing the risk of a fire. Dryer lint is highly flammable, and it doesn’t take much to ignite. Cleaning your lint trap after each load of laundry is a good practice HOWEVER small particulate of lint will bypass this trap and stick to the moist walls of your dryer vent system. Over time, this trapped lint chokes the ventilation and prevents efficient heat escape. 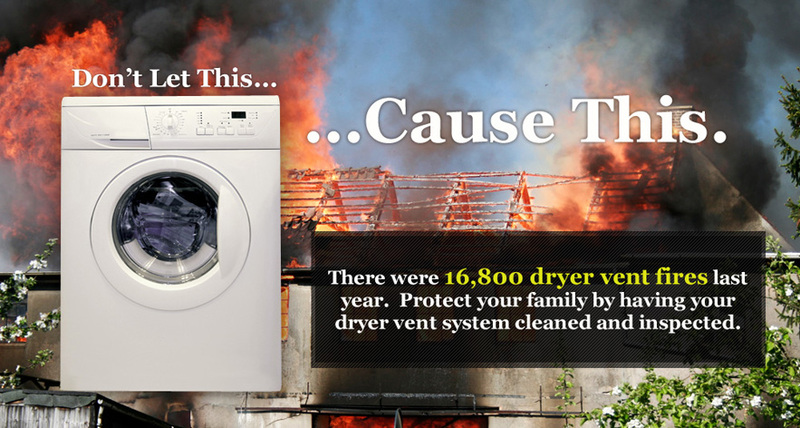 Dryer vent cleaning is recommended every 2-3 years, depending on how often the dryer is used. The drying time for your clothing takes longer and longer, or you start to experience moisture in your laundry room when drying clothes. A clogged dryer duct can increase the amount of time it takes to dry clothing by double or triple the time. Clothing that takes twice as long to dry is not only an energy waster but also a fire hazard. The longer your dryer runs, the more wear and tear on the unit and reduced life expectancy of the dryer. Do you notice that the dryer is unusually hot to the touch or that the clothing is much hotter at the end of the drying cycle? If the dryer duct becomes clogged, it makes it so the heat can’t escape the machine properly. This can cause the heating element or the blower to wear out or overheat. In time this will damage the dryer and create the need for costly repairs or possible replacement. Do you smell a burning odor when you run your dryer? Lint Is exceptionally flammable, and if this trapped lint gets too hot, it can catch on fire. If you start to smell a burning odor while running your dryer, stop and get it inspected. The outside vent hood is clogged or doesn’t open. The outside vent opening of the dryer duct sometimes has a flap that opens and closes. If this flap isn’t opening while the dryer is running, then it is most likely clogged. Dryer ducts are also favored by critters (birds, rodents, and reptiles) to hide because they can stay nice and warm. If this outlet doesn’t have a flap and it’s just an opening, sometimes birds make nests inside this and cause clogs. If Tru-Clean Carpet & Tile Care can ever be of service in helping your dryer to run more efficiently and to help prevent a dryer duct fire, please do not hesitate to give us a call any time. For more information about our services, please visit us online at www.ForCleanCarpets.com or call us any time at 239-541-4888.